While attempts are made to keep the delivery information on this page up-to-date according to each supplier, information contained on this page may change without notice. Poly tanks are delivered throughout South-East Queensland and the northern tip of NSW from QTank’s rotomoulding facility located in Brendale, Queensland. 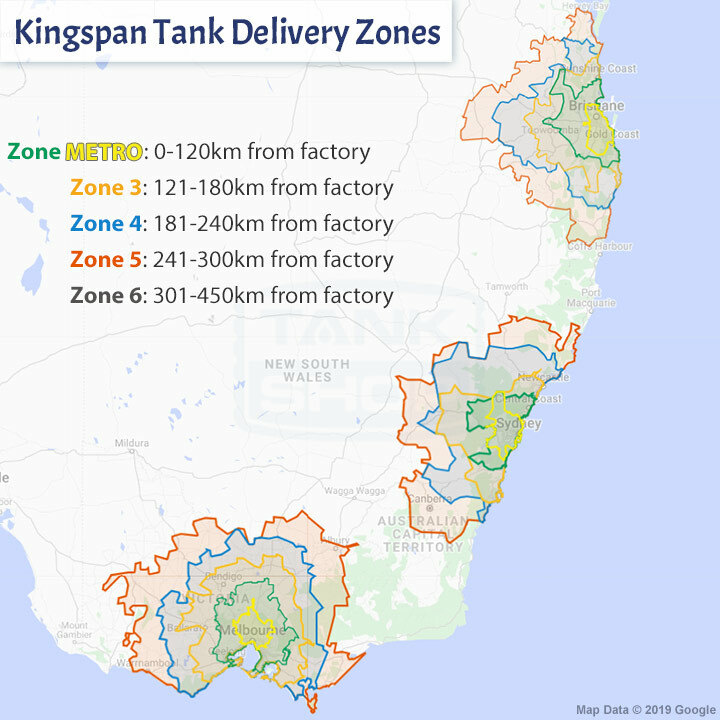 Kingspan steel tanks are delivered within 300 km from manufacturing facilities located in Crestmead Queensland, Smithfield NSW and Somerton Victoria. Manufacture to delivery is approximately 2-3 weeks during non-peak periods. Delivery date will be arranged with manufacturer and you will receive notification. If unsuitable, please advise ASAP and we’ll reschedule for you. c) The weather is reasonably fair. If your Kingspan tank cannot be delivered due to access issues, re-delivery will be rescheduled and additional charges may apply. Pumps and rainwater havesting accessories are shipped Australia-wide. Tank Shop’s policy is to have all orders for pumps and accessories processed and dispatched within 1-2 business days after full payment is received. Depending upon the product, your location, and nominated couriers, delivery time after dispatch might be as little as 1-2 business days up to 10 working days. Due to circumstances outside of our control delivery may sometimes take longer than advised, for example, to remote areas, Australian islands, etc. Please understand, we stock few items and often rely upon stock reserves with manufacturers and wholesale suppliers when fulfilling orders which guarantees fresh stock. We do not deliver to destinations outside of Australia. While we desire all deliveries to go smoothly, courier services are sadly normally as good as the person delivering on the day. If your order doesn’t arrive after a reasonable amount of time, please contact us. Rest assured that we will follow up with supplier and/or courier and keep you fully informed. Where parcels in an order must be signed for, and no one is present to sign on day of delivery, notice of the attemped delivery will be given either in the form of a card being left, email, SMS and/or via an online tracking page. If such a case arises, while we will do our best to facilitate the process of getting the goods to you, it is your responsibility to do everything reasonably possible to obtain your goods including responding to courier notices, arranging re-delivery and/or picking goods from a pickup point. Failure to do so may result in goods being returned back to us or our supplier/s. Should a parcel be returned back to us or our supplier, free re-delivery or a full refund on items ordered will be offered where delivery failed due to a fault of our own. Pickup is available from tank manufacturers, but unavailable for rain harvesting accessories and certain other products we courier direct from supplier.